Get artistic this Halloween with our Scarecrow and Indian Makeup set. The kit includes red, black and brown cream, which washes off your skin with warm soapy water. 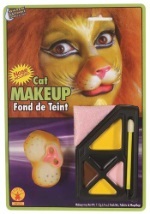 Get an original Scarecrow or Indian costume face with this makeup.